HTC's new One handset 'only' offers a 4MP camera, goes retro with an infra-red blaster – but here's why you should take notice of the new features. Some people might look at the spec sheet of this new phone, albeit one with a fancy chassis, and decide that it's not worth the cash; after all, who wants to pay top dollar for a phone with a low-res camera, right? You might be thinking that the camera on the HTC One is a little bit low-end for the amount it's going to cost – but while the likes of Sony are chucking 13MP sensors on the back of the Xperia Z, HTC wants to dispel this 'megapixel myth' that more pixels equals a better shot. Phone imaging sensors only have a finite surface area, which is being increasingly squished as designers try to eke more space out of the phone to make it look even more fancy and slim. So therefore more megapixels might mean more sharpness, but that's at the cost of the overall picture. Think of a pixel as a hole to let light in: more pixels clustered together means smaller holes, which means less light and therefore less data to process. With UltraPixels, HTC has gone the other way: making the pixels bigger (2 micrometers to be precise) which means 300% more light in, and yes, you've guessed it, more data. HTC is touting this to bring you much better lower-light snaps and generally better shots. A girl's name? In a phone? No, you fool – it's a Zoetrope. You know, those spinning things that you peer through the slats and you see a horse galloping. No? Well, look it up as that's where the name comes from. The reason for that is HTC's new method of shooting photos means you'll actually start capturing high res footage 0.6 seconds before you hit the shutter button and for three seconds afterwards, thus resulting in every picture you take having a few seconds of video to show the 'context'. In reality this will mean that you've got a Harry Potter-style gallery that lets you see each photo moving – and HTC claims that it won't actually look rubbish as algorithms will be able to chop off that terrible bit at the beginning and end where the you lift the camera up and down. But that's not all – take loads of photos in one album, and a video highlights reel will be created to interpolate stills and moving shots to make a 'real life' photo album, with six themes to choose from (right now) when creating your own personal movies. Don't worry though – it will only be 30 seconds long to keep your friends interested. It will be created in an MP4 format too and stored on an HTC server so it's much easier to share, although you should probably stick it on YouTube as it won't stay on HTC's platform for more than 30 days. Who doesn't love this name? 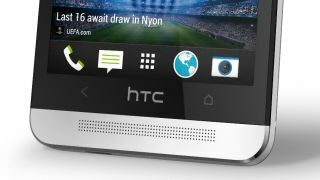 It's the name for the improved sound on the HTC One, which is possible thanks to the dual-facing front speakers and the inbuilt amplifier. There's not a lot more to it than that, but in reality it means that the sound, bass-heavy tracks aside, is improved massively. However, that's only if you're the kind of person that wants to play your music on your desk and doesn't want to invest in a dock, as otherwise it's not really much use at all.